Canadians are using their smartphones and tablets to watch more video, more often. Yesterday, a survey from Catalyst and GroupM showed some scattered insights into smartphone adoption and usage in Canada. Today, digital data firm comScore has unveiled its annual 2015 Canada Digital Future in Focus findings. This year, comScore’s data tracked “the latest trends in desktop, mobile and video consumption,” suggesting that mobile usage is on the rise. While differing from the the Canadian regulator’s own annual survey, which said that Canada has over 28 million wireless subscribers, comScore notes that at the end of 2014 the number of wireless subscribers in Canada grew by 5 per cent over last year to reach 24,318,000. According to the report, 81 per cent of Canadian wireless subscribers have a smartphone, a number in line with what the carriers have reported in their previous earnings. As we mentioned yesterday, Rogers reported in its most recent quarterly results that 84 per cent of its postpaid subscribers own a smartphone, while Bell and Telus reported numbers of 76 and 81 per cent respectively. 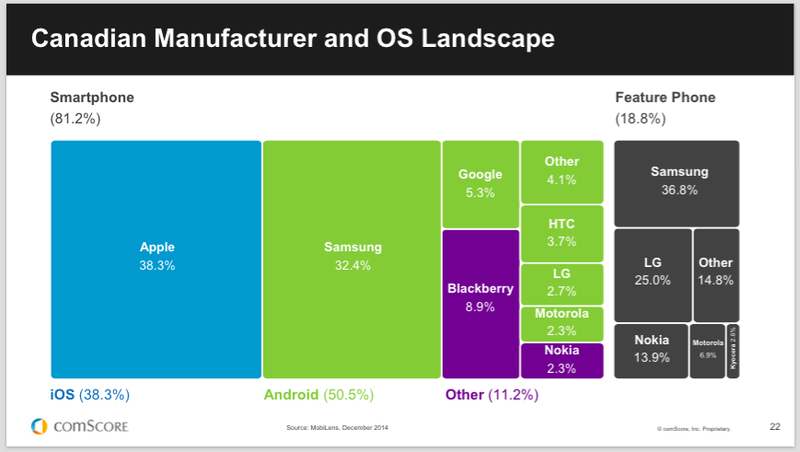 As for operating system market share, comScore says that Google is first with 50.5 per cent of the market running some version of Android, up from 44 per cent a year ago. 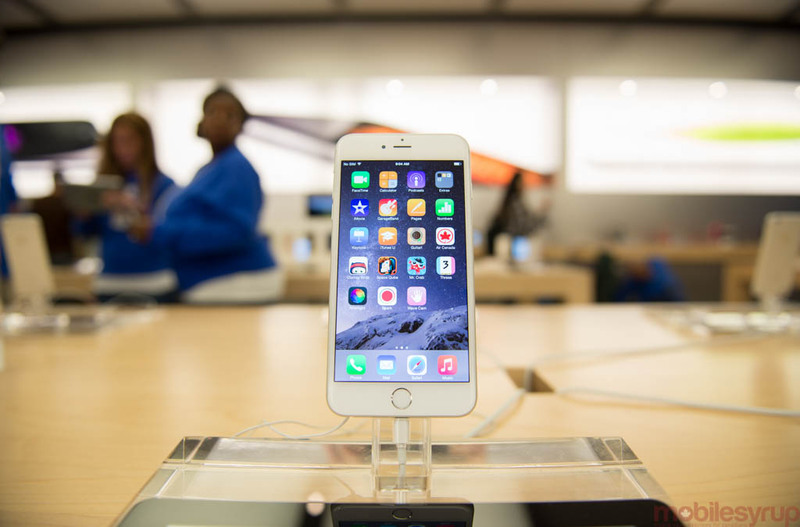 Apple’s iOS increased by 1.3 per cent to 38.3 per cent of overall market. All the “other” operating systems, such as BlackBerry 10 and Windows Phone, combined to comprise 11.2 per cent of the market, with BlackBerry representing 8.9 per cent overall, a decline of 6.1 per cent from a year earlier. Within the Android ecosystem, there is no competition: Samsung rules with 32.4 per cent, followed by Google’s Nexus line (5.3 per cent), HTC (3.7 per cent), LG (2.7 per cent) and Motorola (2.3 per cent). Tablet usage is also increasing in Canada with 9.3 million slates in-market, representing a 56 per cent increase in adoption since June 2013. Another trend the report highlights is TV watching from a mobile device, or, more specifically, using a mobile device alongside the TV. The firm notes that 32.2 per cent of Canadian smartphone subscribers used their phone while watching TV, and that 35 per cent of Canadian smartphone subscribers who own a tablet used it while watching TV.